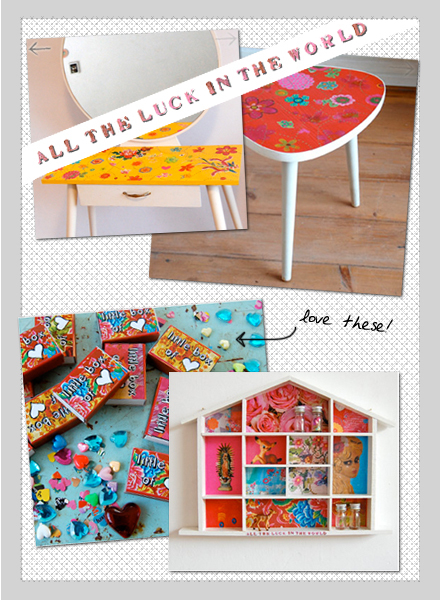 I'm such a fan of Jane Schouten's restyled furnishing, not to mention her own mixed media art work. "turn my mood around in an instant" is right! the furniture makes me so very happy! Me too, me too! How much do we wish that shop was closer to us? *sigh* Her restyled furniture is to die! what a sweet shop! thanks for the tip! Such a fun and bright shop. Talk about turning your mood around-mine became better just by reading this post! So wonderful! Poking around the site, I see so much that makes me smile.